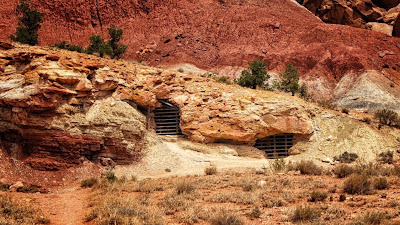 When I first saw John McCann's photo (below) of uranium mines in Capitol Reef National Park I was disappointed that the parks had allowed such a thing. John quickly set me straight though--the mines had been established in 1904 and the park was not created until 1971 (in fact, the Park Service has been working to make them safer since taking over.) Once I learned the timeline I calmed down--in fact, the mines seemed kind of a cool remnant from the past--but it got me to thinking about the transient nature of our public lands. It was funny that the mines in Utah bothered me so much, especially considering how I enjoy exploring the backcountry of Death Valley and all the abandoned mines there. The valley has such a dry climate that the old mines seem to have hardly aged; you can still find intact evidence of the past lying around. It's a thrill to uncover an old can of tomatoes, or find a cabin with flaps of wallpaper, the pattern faded but still discernible. The National Parks have chosen to preserve these items as part of the park's history, even though technically it's abandoned junk. How long do things have to lay around until they are considered historic? Will there ever be a time when that illegal marijuana grow will be preserved for posterity? 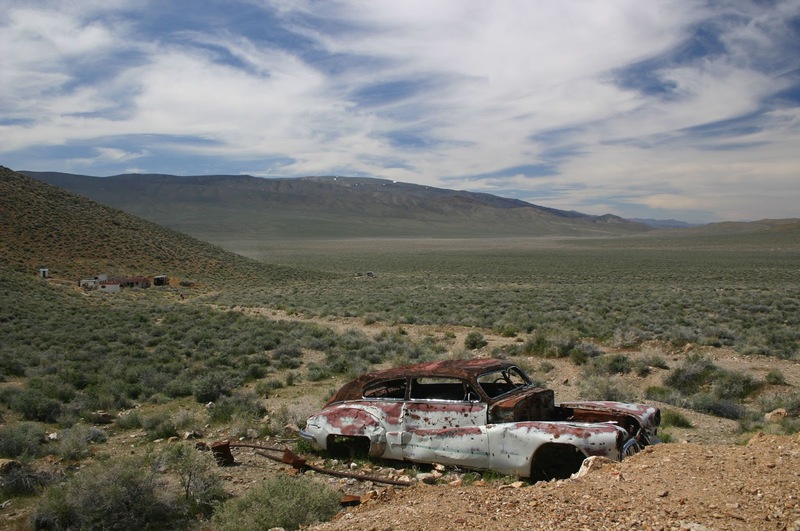 Old car rusting away with Augerberry Camp and mine in the background, Death Valley National Park. 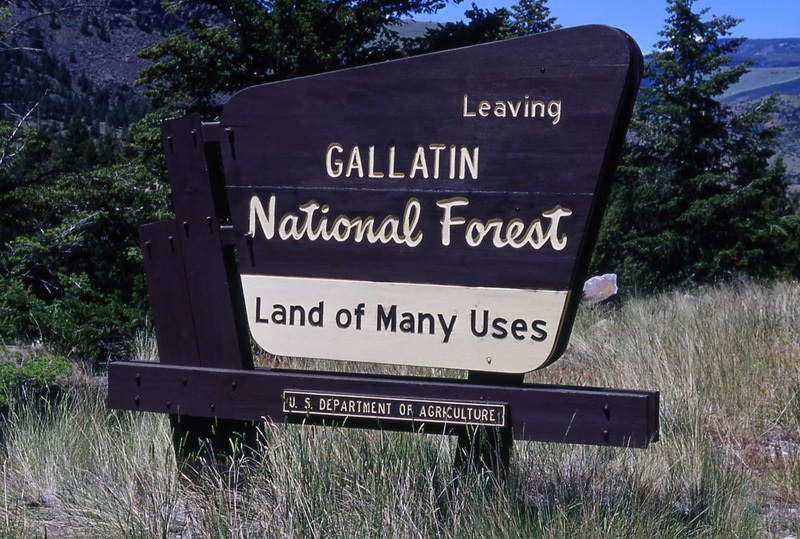 There's a big difference between National Parks and National Forests. 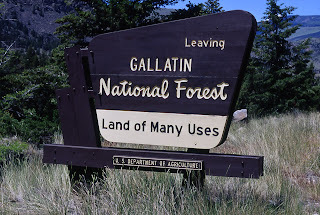 National Forests are generally used for their resources; logging and mining are often allowed, as are a multitude of other activities (off-road vehicles, hunting, cattle grazing); that's why you might see one of those signs proclaiming "The Land of Many Uses" when you enter. When you read about mining companies signing a $1 annual lease for a 100 year contract, the first thing that comes to mind is graft--unfortunately that seems to come with the territory (so to speak.) It's easy to get angry with the destruction of national property, but when you think about it, exactly where did the wood for your deck come from? And how about the gold, quartz and silicon used for that computer and cell phone of yours? One thing that, quite frankly, really pisses me off is finding litter in the parks (or anywhere for that matter.) To see plastic bottles and candy bar wrappers blowing around in the parking lot at Glacier Point in Yosemite just broils my hide. But I have been known to squeal with excitement when I come across old tin cans, nails and other refuse at an old ghost town site. So at what point does litter become artifact? How old does trash have to be before it's a protected object to be collected and cataloged? One man's trash is another man's treasure I suppose. When I was in first grade, a Forest Service Ranger came to my classroom and gave a talk about pollution. 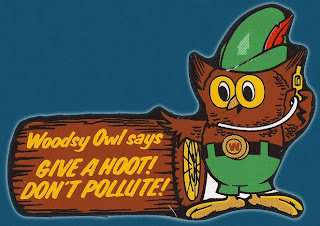 It was part of the "Give a Hoot, Don't Pollute" campaign in the 70's. At the end of the talk he passed around a contract and asked us all to sign our names promising not to pollute, and if we saw litter to pick it up and put it in the trash. I'm sure most of the kids signed and promptly forgot about it, but for whatever reason it stuck with me. I clearly remember signing my name on the line, and Woodsy the Owl's picture on the top of the page. To this day it bugs the hell out of me to see someone throw trash on the ground. And yes, I pick it up and put it in the garbage can. 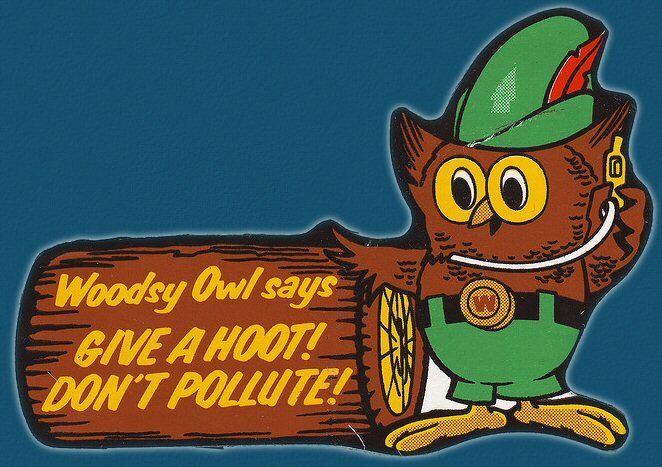 Artwork from the Forest Service campaign, 1970. Nowadays we know a lot more about the harm pollution can wreak on the environment. The huge rotating nightmare of plastic bits in the Pacific Ocean; the ever present plastic bags blowing around the fields, stuck in every barbed wire fence and floating in every urban creek. Before there was plastic, most garbage seemed to break down pretty quickly, and the items that hung around (the tin cans, wooden crates) were more environmentally friendly. The right environment can reduce a tin can to bits of rust in a few years, and wood makes a good meal for insects and fungus. Even asbestos, although a health hazard to breathe, is a naturally occurring substance. Our newfangled junk seems to have more lasting power. I'm not sure what to make of it all; I suppose everything has the potential to be historical if you wait long enough. I will always be excited to run across old mining equipment in the desert, but that's not going to stop me from picking up modern trash when I see it. I signed a contract after all.